“The truth shall set you free.” “Truth hurts.” Have you heard these sayings? Put together, these two aphorism can explain why we sometimes don’t feel as free, liberated or alive as we possibly could. Often, the truth can really hurt. We don’t wish to face the truth because of the unpleasantness or pain it might bring. It is human nature to seek pleasure and avoid pain. In our instinctive urge to avoid pain, we often shortchange ourselves and forgo the joy, pleasure, or freedom that is otherwise available to us. Let me confess on a truth that I have been avoiding. I’m good at starting, and poor at finishing. There is a saying in Malay that describes it well – “Hangat hangat tahi ayam.” It translates literally to “Like the heat of a chicken’s poop” – that remains hot only briefly, and then cools down shortly after. Clearly, I had issues with sustainability. Take writing a book for example, I have lost count of the number of unfinished projects that I had started over the past decade. With the exception of an ebook (A Concise Guide to the NEW RULE of Positive Parenting), which I wrote hurriedly in 2 weeks so as to honor my promise to offer it as a Mother’s Day gift to over 500 participants of a public parenting seminar I conducted, none of my other writings had come close to completion. I used to give myself excuses like … “I don’t think that’s worth publishing”, “There is a more exciting title”, “I’ll complete it during my next break”, etc. In truth, these were simply complex lies that the ego had fabricated to justify my incompletion. The simple truth is – I lacked the discipline to write a book. Having a brilliant idea, a compelling vision, and even a strong desire to realise the idea, just isn’t enough. I am convinced now that any endeavor that is worthwhile involves some degree of hard work, persistence, and perseverance. I have absolutely no problem with working hard, especially when I’m on fire. However, keeping that up over a sustain period of time is what I struggle with. In hindsight, I realise why I took up running in early 2011, and eventually ran a half-marathon in December. It wasn’t about losing weight (shedding 0.1kg in after a full year of regular running is a pathetic achievement). Instead, it’s about finding a way to prove to myself that I’m capable of ‘finishing’ what I had started. I did it! I survived 21km without much pain. And more importantly, it was the discipline of adhering to the 16-week training schedule that conditioned my body for the distance. Honestly, I’m more proud of sticking to the structure, than completing the run. Now, I strive to apply that newly found discipline to bring my long overdue book projects to completion. Yes, I was once a poor finisher. Confronting that unpleasant truth liberates me to live more fully. 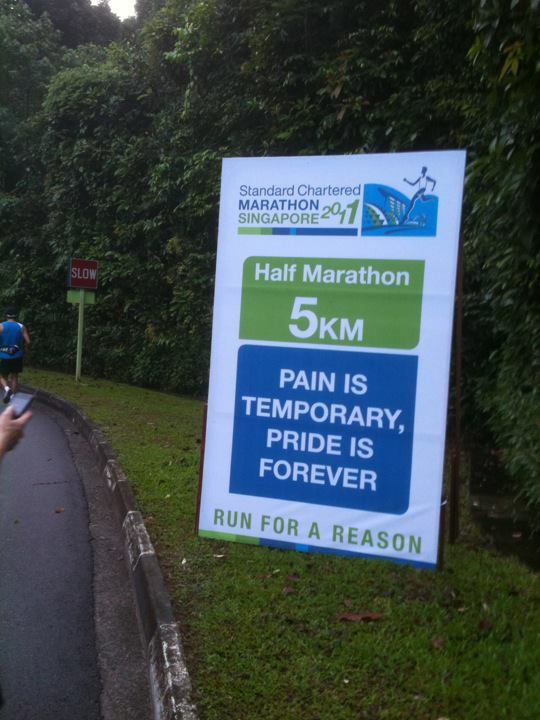 Son, remember the message at the 5km mark: “Pain is temporary, pride is forever.” Whenever you find yourself caught up with the lies or excuses to justify why you didn’t get the results you deserve, get off it and choose to see the simple truth, even if it hurts. Let the truth set you free and journey forward with pride!